Big projects, big plans, big funding mechanism. 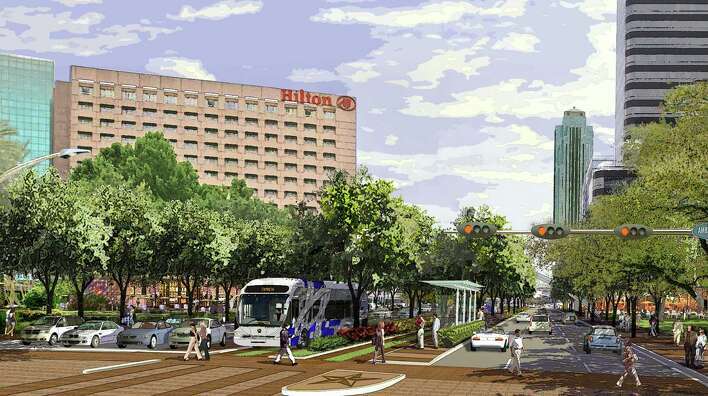 Transit and trees – things that make urban areas move quickly and look pretty – are the centerpieces of a $500 million project that would remake the Uptown area and reinvigorate Memorial Park. Mayor Annise Parker and other officials announced a plan Thursday that would fund construction of a mass transit corridor on Post Oak Boulevard and kick start much-needed reforestation efforts at one of the city’s signature parks. “We’re coming together around a really unique opportunity and a unique proposition to link what’s happening in the Galleria area and what’s happening in one of Houston’s most beloved parks,” Parker said. The estimated cost of the local park and transit projects is $556 million over a 25-year period. Funding would come from property taxes generated as a result of incremental growth in property values within the Uptown Tax Increment Reinvestment Zone No. 16, which encompasses the Galleria and surrounding area. The project is dependent on City Council extending the boundaries of the Uptown zone. The 1,503 acres of Memorial Park would be annexed into the TIRZ 16, as it’s known. There will be a public hearing on the plan on April 24. If progress continues as expected, buses could start running in late 2017. The plan to enhance the park would first involve removing dead trees, bushes and invasive plants that compete with trees for water and sunlight, said Shellye Arnold, executive director for Memorial Park Conservancy. Erosion control and the re-establishment of native grasslands would follow. Up to 15,000 seedlings and trees have already been planted since January. Basically, this is the city’s part of paying for the Uptown BRT line. As reported elsewhere, the estimated cost for that is $177.5 million, of which the city is kicking in $92 million; the rest will come from state funds and an H-GAC grant that uses federal money. Obviously, that means Memorial Park will get the bulk of the TIRZ funds, which makes sense given the 25-year time frame mentioned in the story since the Uptown BRT construction should be done by 2017. Not clear when the Uptown construction would start, but I figure that will come out during the discussion. I can’t wait to see what Helena Brown will make of this. See the Mayor’s press release for more. One thing I haven’t seen mentioned in stories about the Uptown transit project is to what extent bikes will be part of the vision. Once BRT is in place here and Uptown is integrated with Metro’s park and ride network, you would think that accommodating bikes as a way to extend the reach of these things would be desirable. I haven’t seen Uptown mentioned as a future site for B-Cycle, but 2017 is far enough away, and there are enough other obvious expansion points for bike sharing that it may just not be on the radar yet. But I figure we ought to at least acknowledge the possibility now so that we will be ready to plan for it when it’s more timely.